While there is no way to guarantee that an elderly relative will never develop dementia or Alzheimer’s disease, there are certain steps you can take to help decrease his or her chances for memory conditions. To help ensure that your loved one can delay the onset of or prevent cognitive decline, the senior care experts at Harrisburg Home Care Assistance suggest incorporating the following foods in his or her diet. A convenient and rich source of vitamin B12 and omega-3 fatty acids, canned salmon also contains DHA and EPA, which are essential for normal neurological function. DHA not only provides memory support but also thins the blood, optimizing delivery of oxygen and nutrients to your loved one’s brain. Eggs are full of several memory-promoting nutrients, including B12, folate, selenium, vitamin D and choline. Folate is necessary for normal communication between brain cells while selenium has been shown to delay dementia. Additionally, having an Alzheimer’s or dementia caregiver in Harrisburg prepare eggs for your loved one will ensure he or she gets more choline, a brain chemical that is critical for a strong senior memory. Coconut, available as an extract, as well as in dried shreds and its whole and unprocessed form, is the best source of medium-chain fatty acids. When incorporated in your loved one’s diet, these fatty acids are turned into chemicals called ketones, which the brain uses for fuel. Studies have shown medium-chain fatty acids dramatically improve the cognitive function of people with dementia and other memory conditions. Chocolate naturally contains brain-healthy antioxidants, as well as vitality-enhancing caffeine and theobromine. 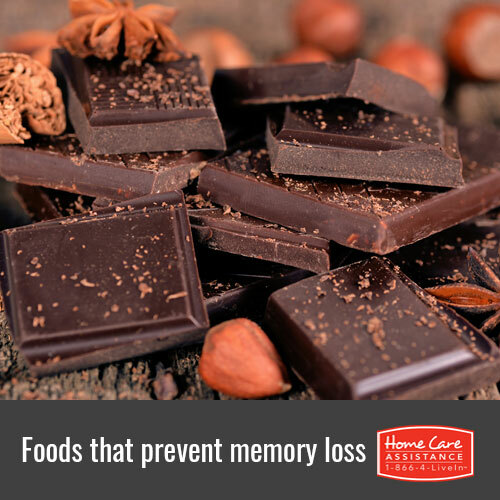 Poor blood flow, a major contributor to memory problems in seniors, is countered by theobromine, which promotes healthy circulation. Chocolate is also rich in tyrosine, an amino acid used to make dopamine, a neurotransmitter that supports concentration, motivation, and feelings of pleasure. Tart cherries, in juice, canned, or fresh form, have some of the highest natural levels of anthocyanins, a family of antioxidants that boost brain function and support the growth of brain cells. At the same time, tart cherries are among the only significant sources of melatonin, which promotes deeper sleep for stronger brain function in the daytime. If you are looking for ways to help promote your elderly loved one’s brain health, the professional assistance of a dementia or Alzheimer’s caregiver in Harrisburg may help. Expertly trained in our revolutionary Cognitive Therapeutics Method, which is designed to support mental acuity and reduce cognitive decline, the experienced caregivers at Home Care Assistance can help delay the progression or onset of memory conditions. To learn more about our care services, give a Care Manager a call at (717) 540-4663 and schedule a complimentary in-home consultation.